Sometimes the incoming data don't look like we want to display them and need to be processed before displaying in a chart. 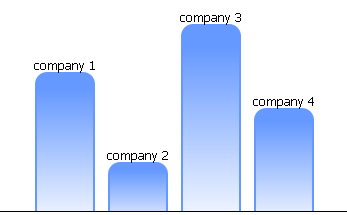 For example, we've got the sales information over the last years in several companies, and we want to show total sales per company in a chart. So, we need to get objects of the same companies and sum up their sales. Grouping helps to resolve this problem. It allows gathering objects with the same value of the defined property and creating one object with new properties. To group data objects, you need to define the 'group' property in the chart constructor or to call the group() method with an object as a parameter. map – (object) an object that defines the properties of the grouped objects. Properties of the grouped objects are set by the "map" attribute and defined by an array. The first element of this array is a template with a property from original data, the second one – the functor that needs being applied to all values of this property in a group. "min" - the minimum value in a group. It's possible to define a custom functor.